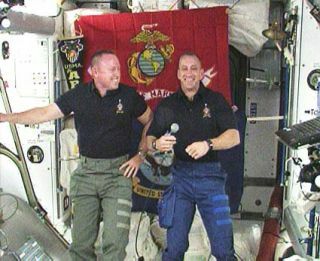 Astronauts on the linked shuttle Atlantis and InternationalSpace Station said Friday that they're not worried about recent false alarmsthat disrupted their sleep with erroneous reports of calamity. "I think they're still trying to get the fullcomprehensive story together," Atlantiscommander Charlie Hobaugh said Friday. "I think they?ve got a prettygood idea of what happened, but it wasn?t really that big of a deal." Shortly after 8:30 p.m. EST Thursday (0130 Friday GMT), the12 astronauts onboard theorbiting laboratory were startled by an alarm warning them that the stationwas losing pressure. They flew into action to investigate the problem, but by9:15 p.m. EST Mission Control teams on the ground had determined there was nodepressurization going on. "The crew was never in any danger," NASA said in astatement. The main alarm shut off ventilation fans, which kicked updust that set off a fire alarm in another part of the station. If real, a depressurization would be no minor trial. Itwould mean that air from the cabin was leaking out into the vacuum of space.NASA is still looking into the cause of the false alarm. Hobaugh said the shuttle and station crews had only recentlyended their day and gone to bed, so some astronauts didn't even lose much sleepover the issue. "It was kind of fun to get everybody together and say,'Hey, what's going on?" and we went back to sleep, so not a bigdeal," Hobaugh said. The erroneous warning did not interrupt any major plans forthe seven-person shuttlecrew or the five-person station crew. Atlantis is scheduled to return hometo Earth Nov. 27, ending an 11-day supply mission to the orbiting outpost andferrying long-term station crewmember Nicole Stott, a NASA astronaut, back homealong with the shuttle crew. The shuttle astronauts are preparing for the second of threespacewalks planned for their mission, set to begin at 8:18 a.m. EST (1318 GMT)Saturday.